A rift in West Antarctica’s Larsen C Ice Shelf is about to expel a 1,000 foot tall, Delaware-sized iceberg into the Southern Ocean. The crack began to form in 2011. But over the past year, it has expanded rapidly. Now this massive, newly-forming iceberg hangs by just a thin 13 kilometer wide thread. As you can see from the above Sentinel 1 animation posted by Adrian Luckman, rift progression has occurred in large leaps as pressure on the shelf reached various breaking points. New additions to the rift have often been in jumps of 20 kilometers or more of rift length in numerous instances over the past year. With just 13 kilometers of connecting ice remaining, the entire state-sized iceberg could now break off at any time. According to Project Midas, late June observations show the crack continuing to widen at the rate of about 2 meters per day. So the larger section of the newly-forming berg is progressing toward the Southern Ocean at a rather rapid rate. And this movement is increasing strain on the small remaining ice bridge to the larger Larsen C Shelf. Once the massive berg breaks off, researchers are concerned that it could precipitate a larger collapse of the Larsen C Ice Shelf itself. Such an event would be the third ice shelf loss along the Antarctic Peninsula during recent decades. A series of ice shelf collapses precipitated by warming oceans and atmospheres induced primarily by fossil fuel burning. 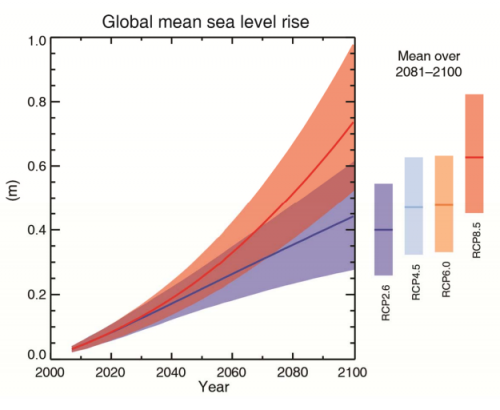 Such ice shelf losses are a rather serious affair as they release the glaciers behind them — allowing these massive ice forms to enter the world ocean more rapidly and thus increasing the rate of global sea level rise. Already, numerous cities, islands and nations are under threat from oceans presently rising at the rate of 3.3 millimeters per year globally. But loss of buttressing ice shelves like Larsen C and others around Antarctica and Greenland may double the present rate of rise many times over. At a recent meeting of over 250 U.S. Mayors in Miami to discuss how climate change is presenting a serious threat to cities, New York’s Bill de Blasio told reporters: “Miami Beach is facing, literally, an existential crisis.” But it’s not just Miami that’s under the gun. It’s pretty much every coastal town, city, state and nation around the world. And Larsen C is just one of the most recent sea level rise canaries to begin to show signs of ailing in the global warming coal mine. Note: 1,000 foot tall reference includes freeboard + below water line measure.